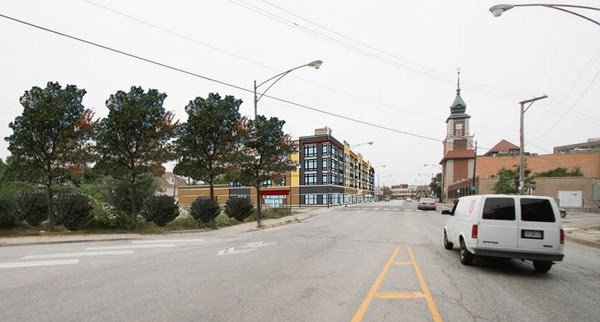 The Chicago Plan Commission at its Feb. 16 meeting unanimously approved a proposal to redevelop vacant lots at Lawrence and Laramie avenues following 15 years of delays. The City of Chicago is selling about half of the 39,000-square-foot site for $1 to the project developer, the Mega Group. In 2006 the city paid $1.46 million for the land, which now is worth about $530,000. The planned development ordinance for the site allows construction of a four-story building with 9,990 square feet of commercial space, 39 apartments and 41 interior parking spaces to be constructed at the southwest corner of Lawrence and Laramie. A 21-space parking lot would be built at the southeast corner of the intersection. In the mid-2000s the properties were to be included in a 10-story development with 132 condominiums, but then-alderman Patrick Levar rejected the project due to opposition by residents. The decision left the city holding about 20,000 square feet of land that it had acquired through eminent domain. Mega had agreed to reimburse the city for its acquisition costs, but that agreement was nullified when the city refused to let Mega build the condominium project. The Jefferson Park Neighborhood Association has been critical of the city’s decision to sell the land for $1 given the city’s financial woes. Association president Robert Bank offered to buy the land for $2 in a symbolic gesture at the plan commission’s hearing. Bank left the money and a hand-written purchase contract on a chair on the floor of the City Council Chamber. In 2015 the city Community Development Commission initially rejected plans to sell the land for $1, but the commission held a second vote a month later and approved the project after Mega agreed to designate about 10 percent of the apartments as affordable units, which would be offered at a reduced rate to people who earn 60 percent or less of the median income in the area. Association board member Ron Ernst said that the second vote taken by the development commission should not have been allowed because it violated the commission’s governing rules. Ernst said that public notice of the agenda item was not properly given. City officials have said that the development would generate $175,000 in annual sales and property tax revenue. The city-owned portion of the site generates no tax revenue, while the portion owned by Mega generates about $5,600 in property taxes a year, according to Arena’s office. The planned development ordinance becomes the new zoning for the site. The ordinance allows the two parcels of the site, which are separated by Laramie, to be considered a single tract of land under the zoning code. Without unifying the lots, the building on the west side of Laramie would be limited to 30 apartments under the existing B3-2 zoning of the site, with an additional nine units being allowed on the east side of Laramie. However, the design of the project was well received at a community meeting that Arena held in 2015. Another community group, Jefferson Park Forward, has a policy of supporting increased density in the commercial district, but it does not take positions on specific projects. Arena has said that increased density in the commercial area will help revitalize. He recently announced plans for construction of 15-story building next to the Jefferson Park CTA terminal, with shorter buildings further from the transit center. The City Council this spring is expected to approve the 15-story project, which includes about 115 apartments and 200 parking spaces.